Welcome to The Sign Studio! 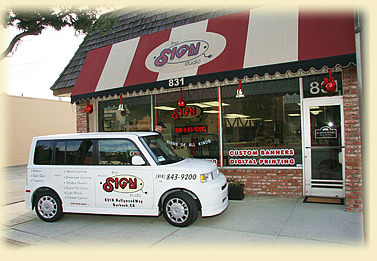 Los Angeles businesses depend on THE SIGN STUDIO for QUICK and CUSTOM sign solutions! We are located at 831. N. Hollywood Way, Burbank, CA. Phone: 818-843-9200, FAX: 818-843-9222 or email us at thesignstudio@sbcglobal.net. Remember, A Business With No Sign is a Sign of No Business!